Governments are smaller than markets; markets are smaller than cultures. What I am saying is that almost everything affecting the needs of people will get done when there is sufficient freedom. 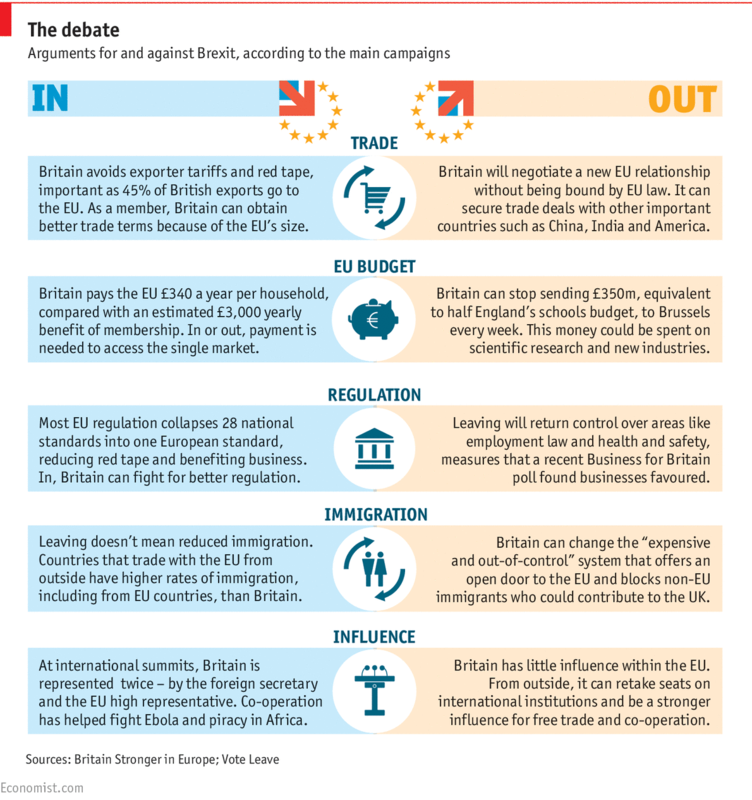 If Brexit occurs, the UK will negotiate some agreement that is mutually beneficial to the UK and the EU, and most things will go on as they do today. Even with a subpar agreement, perfidious Albion is very effective at getting what they need completed. This is especially true of their very effective and creative financial sector in the City of London without which most effective international secrecy, taxation avoidance and regulatory avoidance business could not be done. A second reason not to worry is that leaving the EU ends a second level of regulation of UK economic activity. This will enable better growth in the longer term. Are there things that the UK will lose? Sure, they won’t have as good of a trade deal with the EU, but they will have the ability to try to craft better deals elsewhere, like a Transatlantic Free Trade Area. Looking over this, the UK already depends less on the EU than most member states, making the exit less of a big deal for the UK and the EU. My view is this: leaving the EU won’t be a big thing in the long run for the UK. In the short-run, there will be some uncertainty and volatility as things get worked out. For the rest of the world, it will be a big fat zero, so ignore this, and focus on something with more meaning, like bizarre monetary policy, and the twisting effects it is having on our world, or the global entitlements crisis — too many people retiring, too few to support them, especially medically. So, be willing to take some additional risk if people mindlessly panic if the UK/Britain exits the EU.